Portable digital hardness tester is designed to replace the non-digital, troublesome and expensive handheld hardness testers in the market. 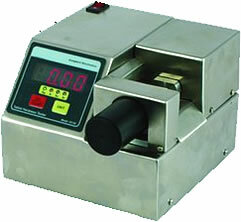 Tablet Hardness Tester allows measuring the hardness either in Kilo ponds, Newton, Strong Cobb or in Pounds. Compact, Simple & Easy to Operate. Selectable Unit of measurement Kiloponds(Kp), Newtons(N),Pounds(lb or lbf) and Strong cobb (Sc). Placing the sample and rotating the knob on lead screw manually, pressure will be applied to the sample. The increasing pressure is monitored electronically and the value is recognized, registered and displayed at the moment of breakage of the sample. The hardness value will be displayed on four digit LED display, same can be viewed in alternative units by simply pressing one soft membrane key on control panel. Calibration can be carried out at location and requires only few minutes. Using the calibration kit user can easily calibrate the instrument when required. In Automated Tablet Tester advanced microprocessor control, accuracy and versatility are now together in one instrument and capable to measure width, thickness, diameter and hardness. The functionality of the Automated Tablet Tester can be extended by attaching analytical balance through the serial port for the fifth parameter 'weight' of the tablet can be recorded and correlated to other measurement parameters. The tablets are inserted manually, one after the other, into the test zone of the instrument. The top-loading jaw design accommodates any shape and size of the tablet with out changing any alternative / additional jaws. Create Recipe feature reduces the pre-test settings thus saves user' time. While creating the recipe one can feed the nominal values; plausible limits by setting tolerances -T2, -T1, +T1 & +T2; units of measurement for all parameters of the product. Up to 50 recipes can be created and stored. When test started it prompts to select the recipe, the selected recipe information will be loaded to perform the test. Sample size can be set from 0 to 100 for each parameter independently per test. User friendly 'menu driven operation' through PC compatible key board makes the operator comfortably go with instrument at minimum period of self-training. After completion of the test, user can view the test results on monitor like large 240X128 LC display. After completion of the test a comprehensive test report is generated & stored in memory and it can be only printed as and when required number of copies, once new test started the previous test report will be erased and same will be prompted on the display. Test report comprise of Instrument Information, User Information, Product information, Test Information, Statistics and Test Data. In addition to the test report generates the following reports: User Report, Recipe Report, Calibration Report, Verification Report and Test Report. Calibration / Verification of Hardness parameter as well as distance parameter can easily be performed in lab any time using supplied calibration kit and optional certified 5Kg weight & 10mm gauge block. The compact space saving design includes removable stainless steel / acrylic tray along with cleaning brush, to neatly retrieve the tablet debris. Compact, space saving and with advanced microprocessor design yet economical price. Accurately measures the width, thickness, diameter and hardness of the tablet. 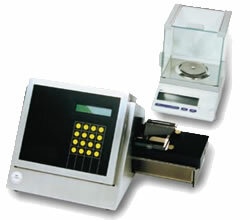 Analytical balance can be connected for measuring the weight the fifth parameter. Menu driven operation together with pc compatible Keyboard and large 240X128 graphic LC Display makes operation simple. Unit of Hardness in Newton (N), Kilopond (Kp), Strong Cobb (Sc) and User Defined (UD). Precise positioning of sample accommodates any shape tablet up to 36mm Diameter (length). Incorporated the CFR21 Part 11 feature of password protection (3 level ADMIN, SUPERVISOR and USER password). 50 different product recipes can be created stored and recalled. Settable sample size up to100 Samples per test. Simple & easy calibration and / or verification (Validation) with certified 10mm gauge block for distance parameter and 5Kg weight for hardness parameter. RS232 interface for connecting with PC. Parallel Printer Interface. Various reports can be generated. Supports Dot matrix / DeskJet / LaserJet. Accessories Standard: Parallel Printer Interface cable, Mains cord, In-built calibration kit, Tablet Debris collection tray, Cleaning Brush, Operating Manual. Optional: Certified hardened chrome plated brass bullion weight 5Kg for Hardness calibration. Certified hardened chrome plated brass bullion weight 10Kg for Hardness verification. Certified stainless steel gauge block 10mm for distance parameter calibration. Epson LX300 dot Matrix printer.